As described. Does a good job of keeping the light at bay. 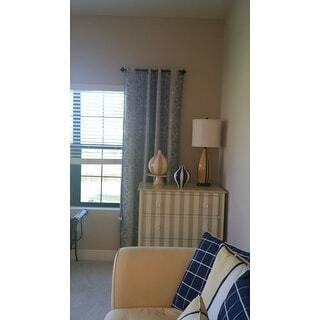 Decorate your home with this fabulous curtain panel. 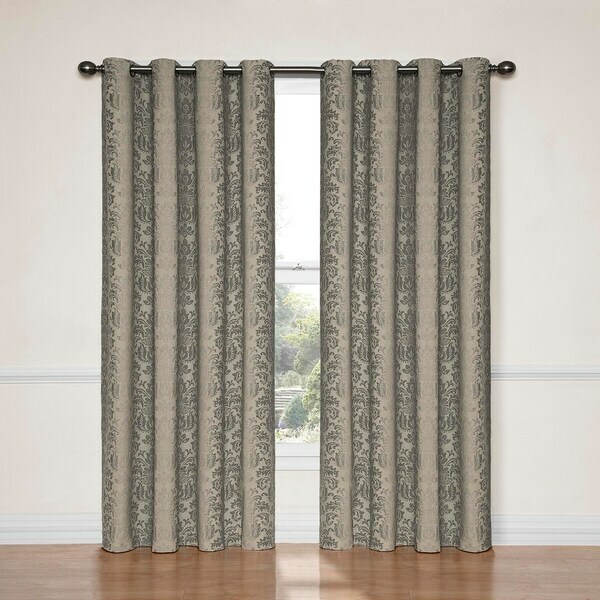 This polyester curtain panel comes in black or linen to blend with your home decor. The medallion design adds to its stunning style. Transform any room in your home with the Eclipse Nadya blackout curtain. Independently tested, eclipse offers a superior blend of window fashion design and blackout technology for any decor. Update the bedroom, living room or dining room and enjoy the light blocking, noise reducing, energy-saving benefits of Eclipse. Perfect for daytime sleepers of all ages, home theater enthusiasts, and energy saving conscious home owners, Eclipse curtains offer style versatility for any living space. The patented Thermalayer process transforms ordinary drapery panels into a light-blocking, noise-reducing, energy saving solution for the home. An independent blackout layer lines the back of the curtain fabric to enhance the window treatment while allowing for the same drapability of naturally flowing curtains. Hang eclipse curtains in any bedroom to achieve an optimal sleeping environment. Each Eclipse Nadya grommet panel measures an extra wide 52 inches in your choice of 63-inch, 84-inch or 95-inch lengths. 1.5-inch silver grommet accommodates a 1-inch rod. Faux linen woven drapery offers a textured hand with faded medallion all-over print. 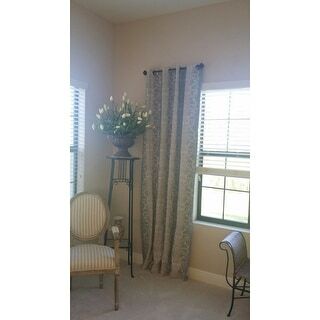 Hang two drapery panels on decorative curtain rod for optimal light-blocking coverage and decorative style. I really liked the way these looked online-but was curious to see what they looked like in person. I was so happy when I opened them up & they exceeded my expectations! They look even nicer on the walls! They have a distressed country french feel to them & go perfectly w/the colors in my home. They have a very heavy, rich & luxurious feel to them. So happy w/this purchase! Sorry for the washed out photos-but that's the morning sun for ya! It says Black. Not Black at all. Disappointed. The product clearly says Black. What you get in the mail is gray. Which is not Black. Then Overstock charges you to send the defunct product back. Not cool! Will be the last time doing business with Overstock! Buh-bye. These blackout panels are good for what I bought them for--to create a light block in our guest bedroom with a large window that faces the morning sun. I am a seamstress, and I made our other drapes. But I didn't have time to make drapes for this room, and guests were coming to stay. That said, the quality of the fabric isn't the best, but they were inexpensive and they did the job well. I have purchased these blackout curtain for the Living Room, Family Room and Dining Room. Look great, add just a touch of color, heavy duty and perfect to keep out the summer sun. Was looking for something unique and not pain. Great material and blocks out light totally. After looking for awhile for the perfect curtains I've found them, they are a perfect decorative yet efficient addition to my room. The curtains arrived today. When I opened the package I was disappointed. They did not look like the picture. The colors in the curtains were very faded and dull. I am going to send them back. I will look some more on Overstock and see if I can find some better looking blackout drapes. The pictures do not do these curtains justice. We purchased the blue ones. My husband found them on another site and sent the name to me. Of course I turn to Overstock....I hated them. I couldn't believe he would want them. It looked like the blue ones had some weird brown wash over them. Then he showed me the pictures from the site he saw them on, they looked better so I took a leap of faith...I'm so glad I did. These are Beautiful, subtle, and really transform a room. I wanted panels to keep out all light and this was the best buy I have ever found! The quality of the texture and the color couldn't be better for the price. These curtains are even nicer in person and they totally block out light when pulled closed. I have the blue and I just love them! Totally changed the room. These look great! They work very well in our living room. Looks great!! I am quite pleased with my purchase. love these curtains keep coming back for more. keep us warm in the winter and cool in the summer. Very nice and great quality. We love overstock.com!! I love these curtains! Quality material and they are beautiful! The color goes great with our Behr Ashen Tan paint and wood accents. Really brings together the grey/tan color palette of our room. This is the 2nd room we have used these panels in. Vintage look. Great quality. Rooms feel much warmer in cold months and cooler in summer months. So glad we searched Overstock and found them! !